When Steve Dressler of Sierra Nevada spoke at Hop Union’s Hop School he said they had stepped away from filtering that it tends to strip flavors. They are moving more towards centrifuge obviously not an option for the homebrewing environment. I tend to think time, racking, and fining agents can get most of the same results with less work by the homebrewer. Some people will want to filter and do the extra work but I am not convinced it’s worth it. Thomas – thank you for the comments! I personally rarely filter as I find (like you) that other methods work well, and I typically have the time to properly age my beer. However it is an interesting tool for the advanced brewer. you say filtering removes any remaining yeast so it’s not an option for bottles, but big breweries seem to offer a fully filtered beer in their bottles. How do they do it ? The large breweries will force carbonate the beer with CO2 and then use a counter-pressure bottle filler to fill the bottles while maintaining proper carbonation. Home brewers with a keg system and counter-pressure bottle filler can do the same thing. I have an article on counter-pressure fillers and beer guns here if you do a search of the BeerSmith blog. I am planning on getting a brewing system (might piece one together myself. I was just wondering what you would recommend for somebody that wants to keg and bottle. I have thought about using two glass carboys (one as a primary and another as a secondary fermenter). Is that worth it or not? Also, is brewers yeast needed or is regular yeast work as well? Thanks a bunch for the article. It really saved me on a recent ESB. I had fermented at the correct temperature and pitching rate with Nottingham, but it wouldn’t finish up or clear. I left it in the primary for 3 weeks, and the FSG was holding, so I know it was finished fermenting. Sadly, it still had a fairly good haze to it and some green-apple flavor. Even after a crash chill and letting it sit another 4 weeks, these characteristics remained. Then this article came in email and I decided I really had nothing to lose. I built up the filter, ran the beer through, and re-carbonated to recover some that came out of solution in the process. This beer is crystal clear and has a fantastic flavor now. I will probably not filter every beer I do, but this is a tool that I will definitely use again. Thanks again, and keep the articles coming. Great article. I have recently revived my old brewing equipment and gotten back into it. I have a bit more time and patience these days so I am trying (like everybody) to find that perfect taste. I was convinced that filter would get me closer but I cold not that figure out how to do it for the reasons you mentioned above. Anyway, it’s nice to know I wasn’t the only one thinking about this. I have a friend that’s a plumber so I got the filter cheap. I ruined five gallons of blond ale. After I ran it through the filter it tasted like liquid butterscotch. I still tried to drink it, but man I just couldn’t. It broke my heart to poor it out. I figured out what I screwed up on. When I hooked up the filter I went from the chilled uncarbonated keg through the liquid side, through the filter to the gas side of the other keg. The beer dropped to the bottom. I think I killed it with air. I should have connected the last keg to the liquid side with the pick up tube at the bottom, so the beer wouldn’t have fallen to the bottom of the keg. But one thing that was great is the beer was beautifully clear. It looked like store bought. Now that I know what I did wrong I have thought about trying it again, but pitching that other batch is making me gun shy. I have oxidized the hell out of a beer before and although the keg only lasted a few weeks I didn’t notice any unwanted flavours. on your website, is it available in usa only. I don’t know many of the UK brewing shops but I bet if you posted a note on the forum (beersmith.com/forum) someone there can point you in the right direction. 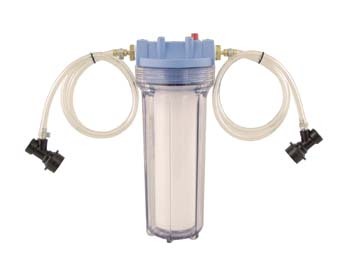 I am putting together a canister beer filter like in the image show at the top of this page. My dilema is the type of filter to use, I have seen charcoal filters, poly filters and nylon filters, is there any reason not to use a charcoal filter with a finished beer? i was thinking about the yeast removal when filtering. could it be possible to collect the filtered beer in a santizied bucket, add simple syrup and yeast, then bottle it. the simple syrup and yeast should carbonate the beer. what would u think about this technique? the only downfall i would see is having to use twice as much yeast for the entire process and the new yeast might throw off flavors in the finished beer. I have been brewing for about 15 years, and I have been filtering for about the last 18months or so, with a filter system that looks very similar to the one pictured above. I keg, and of course, even with fining agents added near the end if the boil, there is natural sediment that finds its way down to the bottom of the keg. With the pick-up tube also at the bottom of the keg, I ended up drinking that sediment with the first round of pints. Not that a little sediment is going to kill anybody, but let’s face it, it makes the beer look goofy and it tends to impart a slightly chalky taste to the brew. I added 1 micron filter set up, and my beer is cleaner and clearer than ever before. I probably have around 50 bucks into it, and I bought it at mt local hardware store. Johne I do the same. In fact on my last batch I used a 20 micron to filter out of the kettle….it really reduced the amount of trub in my fermenter. Thanks for the tips,i made a batch of beer which has a slight haze to it,ran it through a 1 micron filter system,but the haze is still there?should i use a 0.5 filter,the filter system is a clear 10″ filter with a rubber o ring at the top,a white filter but is there mean`t to be a rubber o ring at the bottom?I just popped the filter in and made sure it` didn`t leak and forced the beer under a low presure. I have been brewing since 1993. I have always used priming suger or gile in my proccess. I just filtered my first beer and I looked at a lot of sites to find out what will let a little yeast through. I ended up using a 2-7 micron plate filter hoping that a little yeast will get there. I will update you on the results in a few weeks. Myself and a few mates are all new to home brewing. Have had other peoples home brews and in the past and have left with mixed feelings. A microbrewery opened up near where we live in the Mid North Coast NSW Australia. We were all hooked and bought keg fridges, but alas it went broke. Devastated with what our next step would be we have turned our hands to home brew. Remembering how its easy to leave alot of peoples home brew in the bottle, we have tried to replicate beers to flavour and clarity to what we were getting from the microbrewery. Its still a work in progress but have amazed alot of people with thinking that the beer has come from a microbrewery. I would highly recomend those who have thought about filtering to give it ago. I just filtered for the first time using a filter similar to the type at the top of this page and 1 micron cartridge. I soaked the filter cartridge in a bucket of Star San for about 10 minutes then drained for about 3 hours. When filtering, large amounts of foam were produced inside the filter housing. I poured off about the first 4 pints before attaching to the keg. It didn’t help that I was filling the keg from the IN post producing even more foam. Ok, so it’s also my first time kegging. The beer tasted fine and the pH was around 4 (safer than soda). Is this normal? Is there a better way to sanitize the filter without all the foam? Lastly, has anyone tried cleaning a 1 micron polypropylene filter to be used again? When filtering it might be best to work with uncarbonated beer. You can still apply some lite pressure to it to move it around, but filtering fully carbonated beer can result in some foaming. I don’t have any great tips for sanitizing. I tend to use iodophor because it is stainless safe, and does not require a rinse, though obviously if you leave a lot of it in the filter or beer you will taste the iodine. It sounds like you have a starch haze problem. Test your starch conversion with drop of iodine in the wort. If it turns a dark blue color you have unconverted starches. This happened to me on my first all grain batch. My mash temps dropped and I only mashed for 60 minutes. If I had mashed longer and tested I most likely would have been fine. Did your beer have off flavors? I can’t wait to start filtering my batches. Just got a kegging setup and am about to buy the filter. I primary ferment in 10 gallon corny kegs. I had a welder weld on 4 inch sanitary clamps for a lid, and have a blow off tube that attaches via sanitary clamps. I’m having a hard time picking up yeast and sediment from the bottom when I rack to a secondary keg via CO2. Any ideas on how to keep the yeast and sediment out. I tried cutting the dip tube 3/4 of an inch, but that didn’t completely solve the problem. Any way to fashion a filter on the end of the dip tube? Tom Fillio, the ony thing I can think of is first move the beer over to a new keg, clean keg leaving out the last few pints where the ferment is. Since you are carboninsing, you want to avoid as much as the precipitate as possible. Then from that next keg you can proceed with the carbonisation. I have to say, even when I do this I never will have ‘industrial clear’ beer, but hence filtering with something before that before adding it to the pressure tank. to add to that: it’s what 30 odd litres? Then you should leave out about a gallon (you can always use it in one more brew say, depending on how you do things), Also when I siphon between kegs, I always keep it as close to the surface as possible. Hi there is it possible to filter my beer after it has been carbonated ? in and at the top is a handle to draw the beer ,in the handle is a spot to put a small co2 charge. Curious what people think about filtering an IPA. Will this strip the essential oils from the dry hopped beer? I’m brewing Kolsch in Speidel-Braumeister 50 liters. After transferring to conical fermentor adding Safale S-33 yeast, leaving for 3-4 days, until FG is constant, then transfer either to 30 liters Euro keg or another conical fermentor inside my cold chamber, where it is kept at temps between 3-5 Celsius (37-41 Fahrenheit) for 3-4 weeks. Then taking that keg (beer) at that temp and push it through 10″ filter to another (also refrigerated) keg. I’ve started with 10 micron filter, no results, changed to 5 microns, nothing. Changed to 3 microns, nothing. Changed to 1 micron and again, no result. Beer seems almost absolutely the same as before filtration. I’m not using irish moss, gelatin or anything similar, since I don’t want to add anything in my beer besides water, yeast, hops and malt. So, what am doing wrong!? Thank you! This article explained everything that I didn’t know/wanted to know about filtering! My son and I are just starting to brew at home and were wondering if wrapping the tip of the syphon with cheese cloth would help to filter and clarify the brew without removing the yeast. Our friends don’t filter their brews but I’m looking to impress them with a clearer homebrew. I’ve been brewing for a couple years now and just found out that I have a sensitivite to brewers yeast. Dr says that this should work and I can continue to make beer so long as i filter out all yeast. Its either that or buy comerical. Which is still better than no beer at all !!!!!!! replacement system and i’ll let y’all know the quality when i get it! What filter size do you recommend for secondary “cold brew coffee” filtration? After I’ve squeezed my cloth filter with the rough grounds, I want to transfer the oily coffee through this device. Should I go below 1 micron? I know this article is a little old and activity has slowed a bit but, currently I bottle my beer from the secondary, prime and cap. I still get quite a large yeast sediment in the bottom and I suspect it might be from the yeast in suspension when bottling and not the yeast produced during carbonantion. I’d like to know what size filter I have to use to strip out most of the yeast when bottling to leave just a yeast faint circle in the bottom of my bottles after conditioning has finished. Any ideas or experience will be appreciated. Chad: You mentioned filtering at 0.5 microns and at 0.3 microns in your article. I have never seen a 0.5 micron or 0.3 micron filter. For sterilization, one typically uses a 0.45 micron or 0.22 micron filter. Can you point me to either a 0.5 micron filter or a 0.3 micron filter that works in the housing you pictured. what is the effect of filtering the beer that has carbonated naturally by means of adding sugar? I would have guessed that activated carbon was for filtering organics but it is used for small particles as well. Question: My wife and I have brewed x8-5gal Homebrew’s (always bottling). We just purchased our first kegerator that I converted to a three-tap. 1) Doesn’t the corny kegs feed beer from the bottom? Isn’t all that sediment going to come out in my first five or so poured beers? You can get some sediment in the first few pints, but it will not be a problem for the rest of the keg. Just wondering if I should run saniclean through the filter and purge with CO2 before running beer through it?